Here's how Suzuki's brand new Intruder 150 stacks up against the Bajaj Avenger 150. With the launch of the Intruder 150, Suzuki has made it clear that it wants to win 150cc buyers that want a stylish cruiser at an affordable price. And from what we can tell, Suzuki has done its homework rather well with this new urban cruiser. The Intruder’s styling is perhaps its main USP. Suzuki says the Intruder 150 takes design inspiration from the bigger and badder M1800 cruiser. And that kind of shows. The stretched out big front headlamp with a LED position lamp, the enormous tank with side extensions and scoops, a wider handlebar and a twin exhaust setup give it a bold look. However, from some angles – especially from the back with its rskinny 140 section rear tyre holding all that bulk, it looks a bit disproportionate to our eyes. That said, it’s a design that garners attention and that’s exactly what prospective owners would be looking for, says Suzuki. In comparison, the Avenger 150 looks quite mature and sober. With its all-black colour theme, it’s a bit easier on the eyes. But then, some might say it looks dull and dated now. Also, in comparison to the Intruder's all digital display, the Avenger gets an analogue instrument cluster. The Avenger also doesn’t have LED tail-lamp like the Intruder. Since the Intruder is based on the Gixxer, it’s a petite cruiser with a lot of muscle. On the contrary, the Avenger 150 looks more like a cruiser and it also shows when you compare their dimensions. The Avenger has a longer wheelbase, a bigger fuel tank which will make it an able cruiser, while the short wheelbase of the Intruder will make it a more chuckable in the urban riding environment. The Avenger is powered by a 150cc single-cylinder engine with two valve arrangement. The engine gets an oil-cooler and comes with twin-spark technology and develops 14.2bhp @ 9,000rpm and 12.5Nm of torque at 6,500rpm. Power transmission duties are carried out by a five-speed gearbox. In comparison, the Intruder gets the same 155cc motor from the Gixxer. And while it doesn’t have an oil-cooler or twin-spark ignition, it still develops more power and torque. The Intruder 150 develops 14.5bhp @ 8,000rpm and 14Nm of torque at 6,000rpm. It also has a five-speed gearbox. Considering that both the motorcycle weigh more or less the same, expect the Intruder to be a little bit faster out on the road with its higher power output and torque figures. Both the bikes come with telescopic forts up at the front. However, the Intruder uses a mono-shock suspension at the back against Avenger’s twin-shock absorber setup. In the braking department, the Avenger gets a 240mm disc at front and a 130mm drum brake at the rear. The Intruder gets disc brakes on both wheels – 266mm (front) and 240mm (rear). What’s more, the Intruder also gets ABS – albeit it’s a single-channel system, meaning it only works on the front wheel. At Rs 98,340 (ex-showroom, Delhi) the Suzuki Intruder is around Rs 17,000 more expensive than the Bajaj Avenger at Rs 81,459. 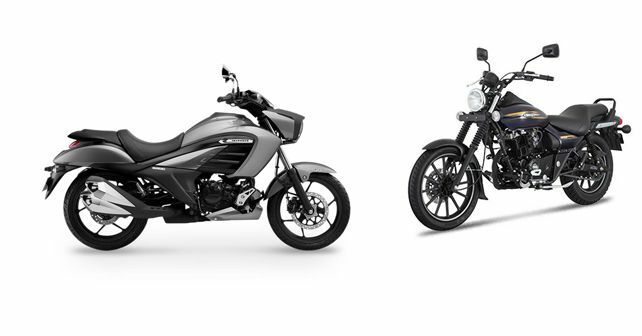 Sure, it’s a lot of difference, but then you’ve to understand that the Suzuki offers more equipment – it has ABS, twin disc brakes and a mono-shock suspension to name some – than the Avenger 150. All said, the Suzuki Intruder 150 looks like a better value, but then it also looks a bit outlandish for everyone’s taste. And that’s where the sober and more conventional looking Avenger 150 has an advantage.